But yesterday the Prime Minister and other world leaders sat down to an 18-course gastronomic extravaganza at a G8 summit in Japan, which is focusing on the food crisis. Even the world's isolated, out of touch, closeted elite need to eat... Besides, poor folk can't afford that kind of food and ya wouldn't want it to go to waste, would ya? I wonder what's the "G8 'Fantasy' dessert" tho. Is it when the stripper gets out of the giant cake? maybe it was 18 different kinds of rice? or maybe it was Ramen? why is it illegal to post what i really want to say? Justin coming out the cake with his guitar, singing "Medicine is all we need ..."
The G8 Leaders liek RaAmen?! time for a revolution...ya think? Will the revolution be sponsored by Coke, McDonald and Budweiser light? G8 conference just a meal. China - Um... Just a band? China - Just a land. Japan - Um... Just a band? 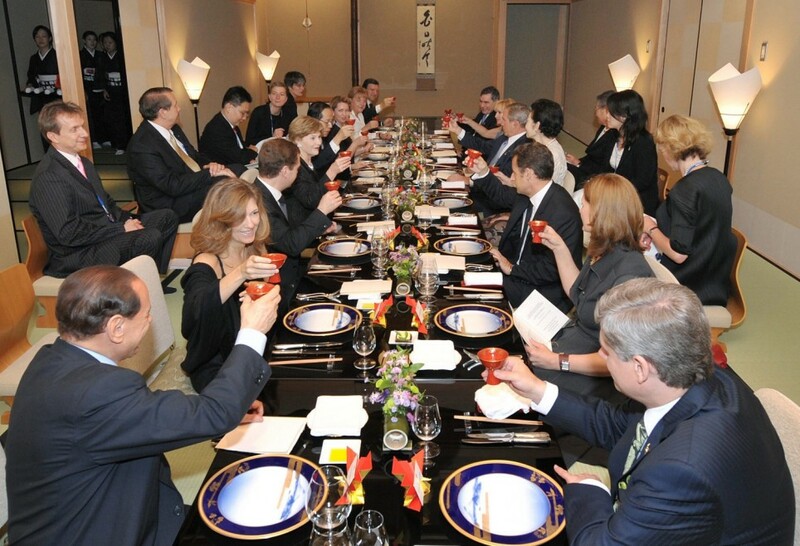 just look at them,smiling and raising their drinks in a toast.toasting all the money they are pocketing. reminds me of brad pitt and his girl there running around adopting all those kids. "look at how much we care and how far we go to help these poor children. "then they spend some absolutly rediculous amount of money to build a new nursery building for their babies.that money could have been spent feeding thousands of other poor children.they just want to look like they care,if they really cared as much as they act like they do they would give everything to the hungry children and not just pick out a specific selected few to shower with privaledges. Old European White Men decide who lives and dies, Japan, 2008. The 'G8 'Fantasy' Dessert' sounds tempting, I must admit. 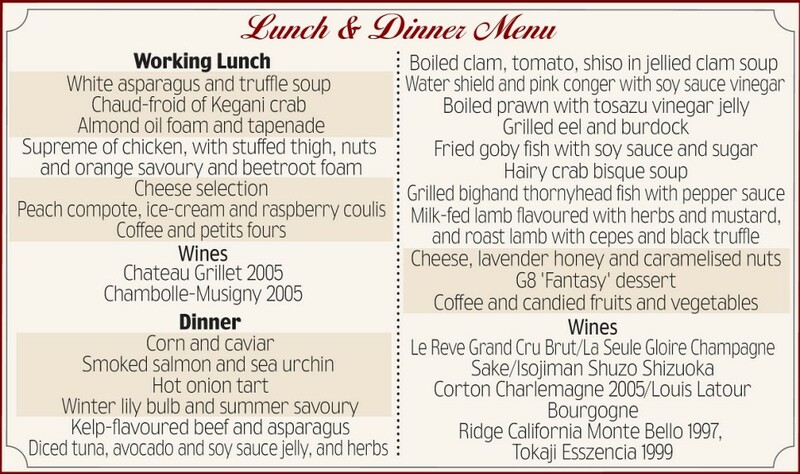 "grilled bighand thorryhead fish"?! ?, has there been a neclear leak? What would you know about global cuisine you roly poly fucker. Been hiding a michelin star or three from us have you? Fat wanker.